We’re taking things to another room of the house (finally)- the bedroom! One of the first problems I needed to tackle in here was storage. For the longest time I was using a cardboard box that was filled with old books that I never got around to unpacking after the move. 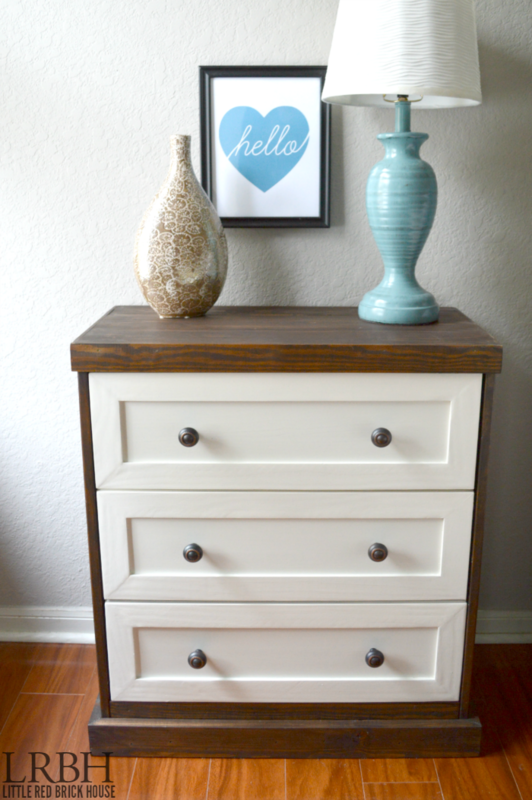 Enter my two toned IKEA Rast dresser hack! I have seen so many hacks all of over the web and I knew I had to customize one of my own. I love that it’s made from real wood and how it provides tons of storage. 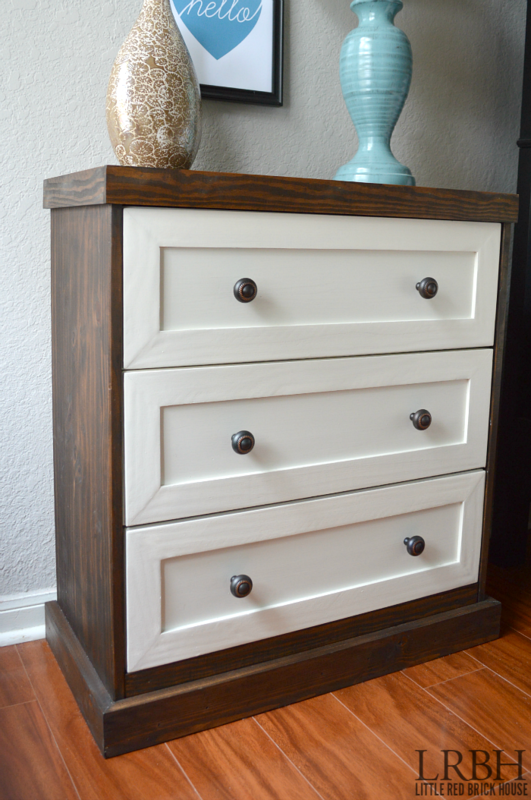 You really can do just about anything to these dressers, and at $40 they are extremely affordable. The final touch was the addition of drawer hardware. I bought the knobs from Lowe’s. 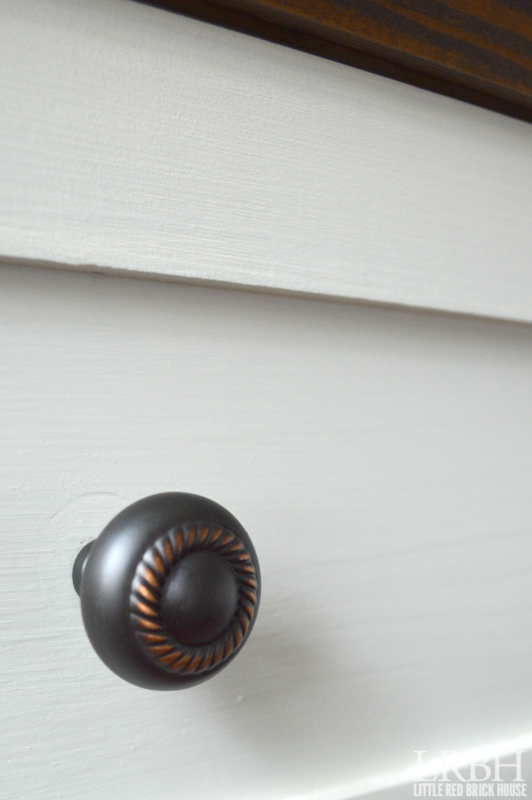 They are the Brainerd 1-1/4 inch Bronze with Copper Highlights Round Cabinet Knobs. I like how they tie in the dark stain with the white paint. And I am absolutely smitten with copper, so it’s a nice little touch, as well. I am loving the added storage as well as having a place to set my phone at night. It’s also nice to have somewhere for a lamp to sit. Now I can snuggle in bed and read or (who am I kidding?) surf on Pinterest before it’s lights out without having the harsh overhead light on. Have you tackled the IKEA Rast yet? If so, I’d love to see it! *This post was originally published at Domestically Speaking on January 14, 2015. SO GOOD! Really looks like a higher end piece! Wow! I love this hack….simple and elegant! It looks nothing like an Ikea piece now. Thank you, Gilly! I love how versatile the Rast dressers are. You really can do just about anything with them. So much fun! Thank you so much, LZ! I love how customizable they are! This turned out really great Sarah, I love all of the trim work. Thank you, Stacey! It’s crazy how much you can change the look of these little guys! This is really nice. Clean lines, and I love the hardware! Sarah, this looks lovely. Your finishing touches are really nice! Gorgeous! Love the combination of the dark and the light. You do such beautiful work! Love what you did with the IKEA Rast. Thank you so much, Marie! You are so kind. Is there anyway I could do the top without a nailgun? I love the look of these, you did a fantastic job! Wondering if you used the 1 3/8″ lattice for these pieces? Thank you very much, Jamiey! I don’t remember the exact measurements of the lattice I bought, but from measuring it just now it appears to be closer to 1 3/4″ lattice. I hope that helps! Thank you so much, Carrie! 🙂 I appreciate the invite, too! Just wondering if you had to adjust your drawer slides for the extra 1/4″ of trim you added to the drawer fronts? Or were you able to use the pre installed guides? Hi, Jamiey! I didn’t have to adjust the drawers slides at all. 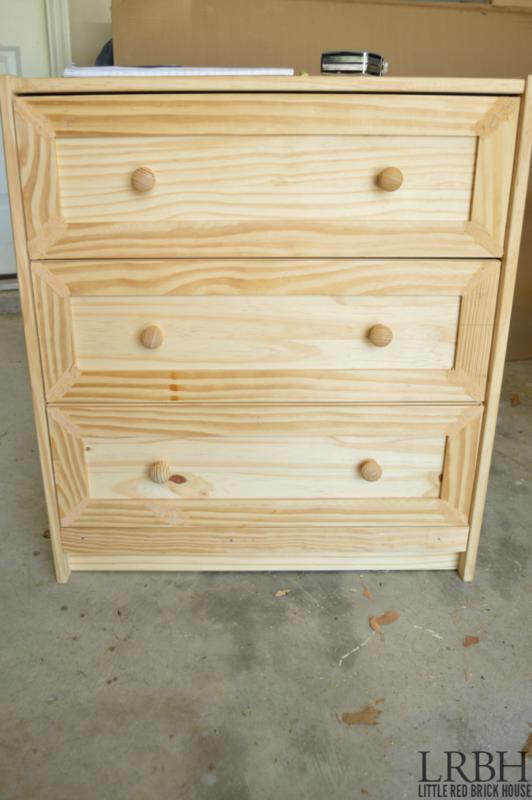 Everything operates pretty much the same as it did before altering the dresser. Let me know if you have any more questions! Adorable, totally saving this! Thank you! 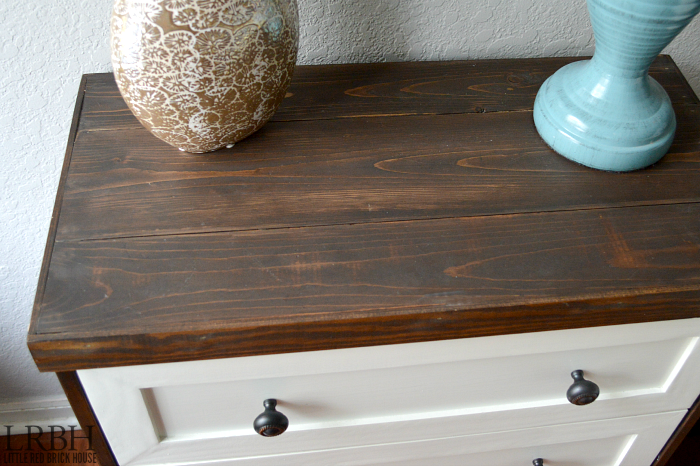 Did you do any sanding to prep for paint and stain? Hi, Rebecca! I didn’t do any sanding of the dresser because it came pretty smooth already from the store. 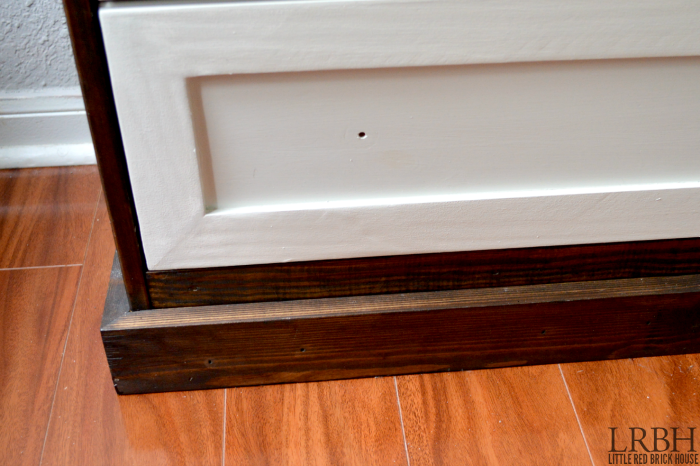 The only part that I really sanded was the wood filler and around the drawer trim. Hope that helps! Do you by chance know how many feet of the various boards that were used? Like how many get off 1×3, etc.